Wind/solar advocates point to continued cost reductions due to technological learning. Wind/solar opponents point to continued value declines due to intermittency. It tuns out that these two effects cancel out fairly evenly. Wind and solar will thus remain as subsidy-dependent as they are today. There can be no doubt that wind and solar power will be important players in the energy system of the future. 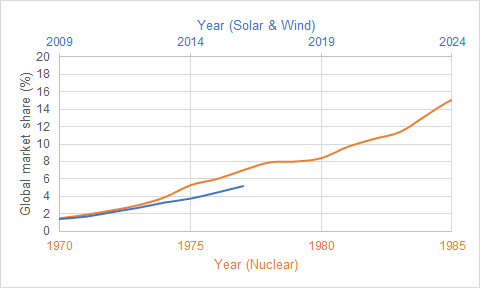 Over the past decade or so, these sources have grown almost as fast as nuclear power did in the seventies (see below). Since 2010, wind and solar have achieved an almost perfectly linear expansion of about 5.5% of global electricity production per decade (2.3% of global primary energy per decade). Although wind and solar are settled as important energy players, the magnitude of their contribution to the future energy system is a topic of vigorous debate. The advocate camp points to the continued cost declines of these technologies, often claiming that wind/solar power will soon achieve competitiveness without subsidies, spelling the end of conventional power sources. The following graphs from IRENA for wind and solar illustrate this argument. 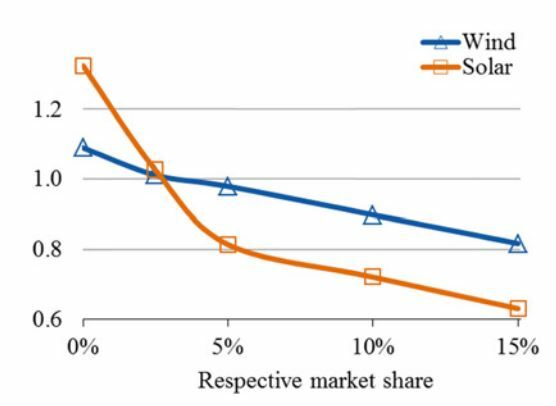 In the opposing camp, people point to the variable and non-dispatchable nature of wind and solar power steadily reducing their value as market share increases. New wind or solar capacity will tend to generate power at about the same time as existing generators, thus creating an oversupply and reducing the value of all wind/solar power in the system. 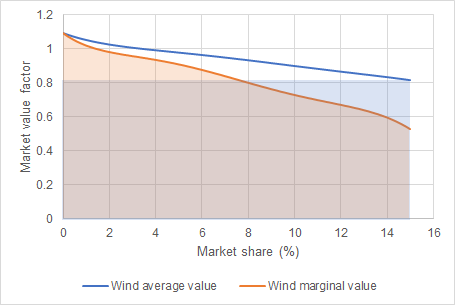 This effect is illustrated below showing that 15% wind market share will reduce the market value to just over 80% of the average for wind and just over 60% for solar. This article will estimate how these two competing effects will play out over coming years. The first thing to clarify in this study is that the value declines illustrated in the above figure represent the entire installed base. 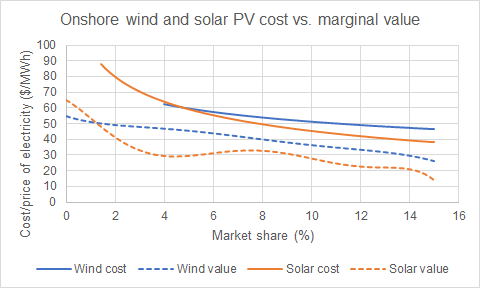 When looking at the expansion of wind and solar power in a race between cost and value, it is best to consider the marginal value of new generating capacity. 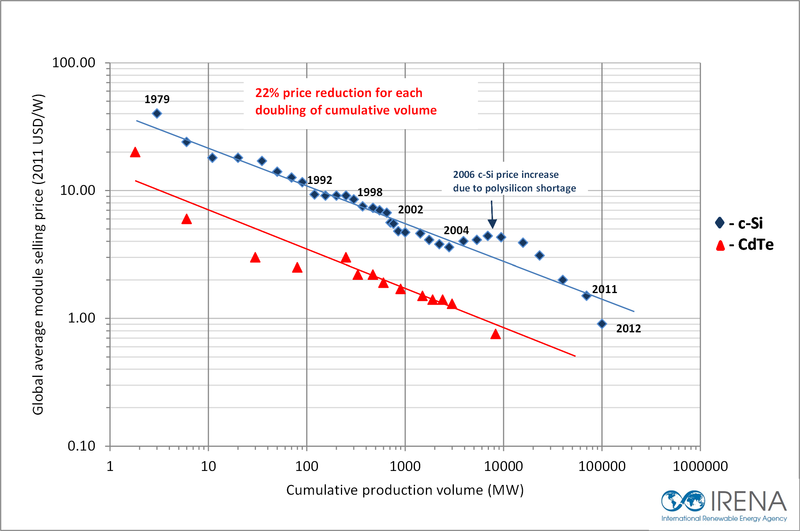 Marginal value implies that existing (more expensive) capacity retains its initial value, while new (cheaper) capacity absorbs the value decline it causes to existing capacity. Mathematically, this implies that the integral under the marginal value curve (orange area below) must equal the area of a rectangle under the average value curve (blue shaded area below). Naturally, the marginal value curve declines more rapidly than the average value curve. This larger value decline is more appropriate for use during the expansion period of the typical deployment S-curve where capacity installations greatly outweigh retirements. However, when the S-curve flattens out (installations compensate for retirements), the average market value becomes the appropriate measure. Since wind and solar will expand for the next couple of decades, the marginal value curve will be explored first in this study. 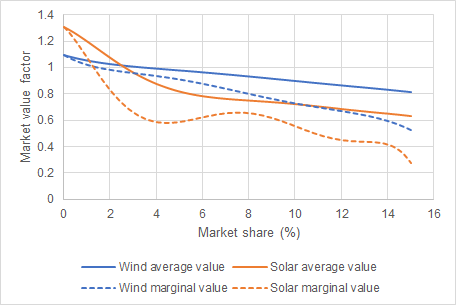 The marginal values of wind and solar calculated from the original data are shown below. The wavy nature of the solar marginal value curve is a result of the mathematical procedure used to generate the curve; it should be smoother in reality. Although estimates on cost declines of wind and solar power are scattered widely, the average tends to be about 10% per capacity doubling for wind and 20% per capacity doubling for solar (see this review for example). These numbers will be used in this study. Calculations of cost and value will be made up to 15% wind or 15% solar power. Note that this represents an optimistically high value factor because simultaneous deployment of wind and solar will further reduce value by increasing the number of non-dispatchable generators in the system. Based on data from the BP statistical review, we will start the study with wind and solar respective global market shares of 4% and 1.4%, and respective capacities of 450 GW and 264 GW. We will assume starting installation costs of $1500/kW for both wind and solar, while future wind and solar capacity are assigned capacity factors of 27% and 18% respectively. Operating life of wind and solar plants are assumed to be 25 years and 30 years respectively with no degradation. A 6% discount rate is employed. Finally, we assume an average electricity wholesale value of $50/MWh and a doubling of global electricity demand by the time that wind and solar reach 15% market share each. It is clear that a persistent gap of about $20/MWh is maintained between cost and value as wind and solar capacity is expanded. This means that the cost declines experienced by wind and solar power are almost exactly cancelled out by value declines. 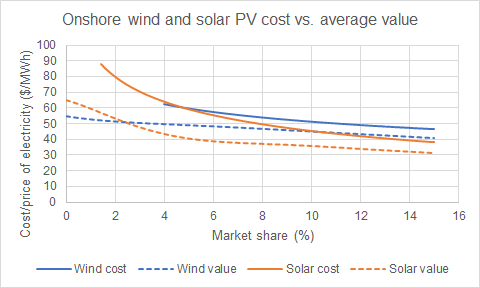 When looking at the ratio of cost to value plotted below, the attractiveness of wind and solar power actually declines with increasing deployment. If wind and solar can double their constant expansion rate over the past seven years to about 10% combined market share per decade, we could end up with about 15% wind and 15% solar by 2050. 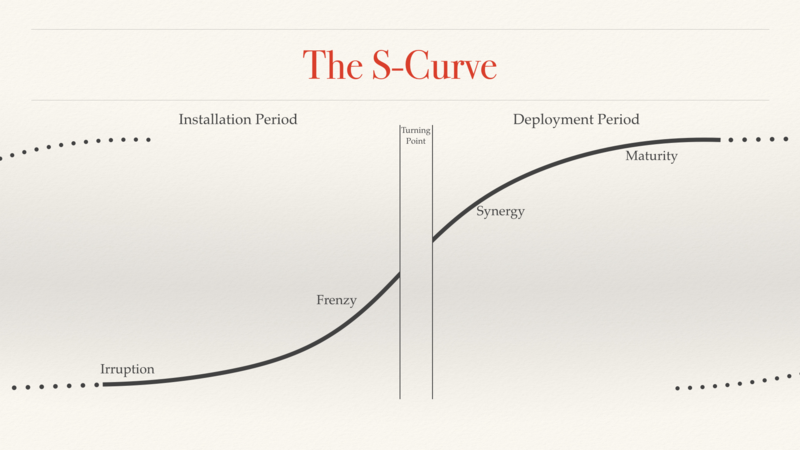 By that time, the deployment S-curve may well start to flatten out as replacements of old capacity start to account for a large portion of new builds. 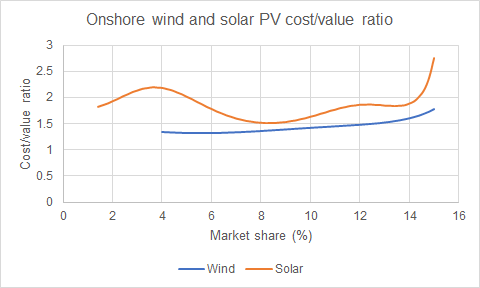 As discussed earlier, this implies that we should start to use average value instead of marginal value for wind/solar valuation. The marginal value graph given above is therefore repeated below for average value. Clearly, the gap between cost and value is significantly smaller in this case, but the gap still persists. As more capacity is deployed to replace retired capacity and facilitate a continued expansion of global electricity demand, costs will continue to decline. However, given that the installed base will be 10-20 times larger at this point than it is today (about 3300 GW of wind and 4700 GW of solar), another cumulative doubling of total installed capacity will take several decades. Further cost declines beyond this point will therefore be very slow. 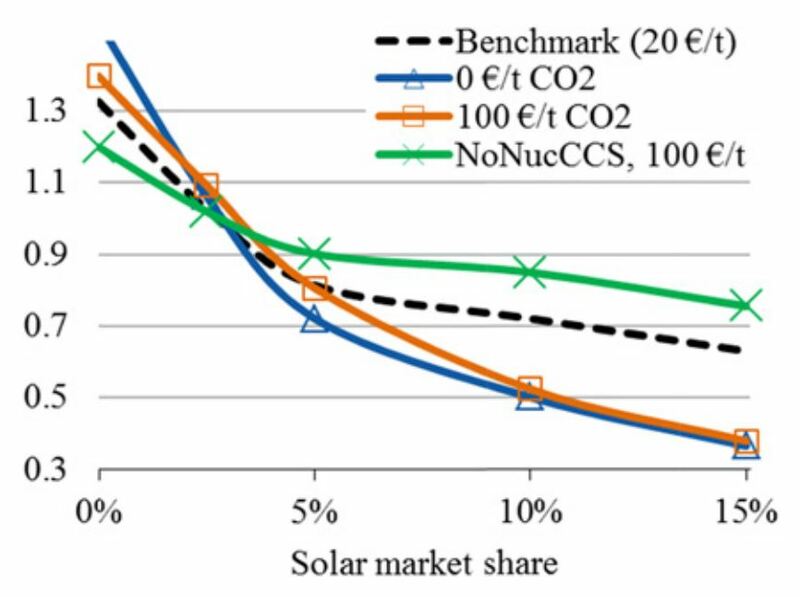 This analysis has shown that the subsidization requirements of onshore wind and solar PV will remain largely unchanged over coming decades. 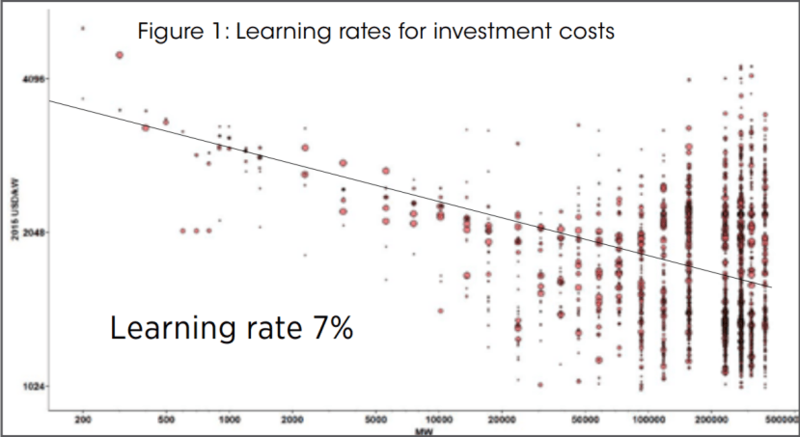 Cost reductions due to learning are cancelled out by value reductions due to the variable and non-dispatchable nature of these electricity sources. Naturally, there are many ways to counter the value reduction of wind and solar power, but all of these methods impose large costs. Energy storage easily gets the most press, but, as outlined in an earlier article, the cost of these technologies needs to fall by at least an order of magnitude before they can start to challenge dispatchable power plants. Finally, it can also be noted that an increase in CO2 price will further reduce the value of wind and solar (below) because this will require low-emission backup power plants. These plants will have higher capital costs, thus increasing the cost related to the under-utilization of capital to accommodate wind and solar. A total ban on nuclear and CCS increases the market value, but total system costs and CO2 emissions will increase by about 25% and 150% respectively in this scenario (source). It should also be noted that a belated shift in decarbonization strategy from wind/solar to baseload nuclear/CCS will strongly reduce the value of existing wind/solar generators (similar to the high CO2 price scenario in the figure below), potentially leading to serious economic consequences. Wind and solar technology-forcing therefore remains a costly and risky pathway to combat climate change. A true technology-neutral “all of the above” pathway is sorely needed.